The lovely Amy took me to meet some good friends of hers last night, Tom and Mindé Briscoe, and their young son. (Tom's got his last name on his website, so I don't think I'm giving away too much by mentioning his last name. The son in question shall remain unnamed for the time being, though.) We all had a great time. Tom, it turns out, is the cartoonist over at Small World, and I'd be quite remiss if I didn't, having establish personal contact, establish blogly contact as well. Tom and Mindé are fellow geeks, and I foresee many fun evenings of gaming, computing, movie-watching and other geekery with them in years to come. I've had spacefarer's stars in my eyes for my entire life, or at least as much of it as I've been out of diapers. My bona fides are many and varied: I built plastic models of the Saturn V rocket, the lunar module and the Space Shuttle through most of my childhood, I watched as much (classic) Battlestar Galactica as my parents would let me stay up for, I collected obscure space toys, I had the freakin' Mission to Mars suit for my Six Million Dollar Man action figure. I had a subscription to Odyssey magazine for years, and read and watched as much science fiction as I could get my hands on. I was born in 1970, so I wasn't really old enough to pay proper attention until the Space Shuttle was the current spaceflight deal going. I remember collecting photos of the test-shuttle Enterprise, watching Columbia's first liftoff. The shuttle was supposed to be the glitzy new spacecraft. It was over budget, overdue and costlier to run than forecast, but then what NASA project wasn't? Liftoff after beautiful liftoff reinforced my opinion of the Shuttle as a good, modern design--the dependable, reusable "space truck" we'd all hoped it would be. This is all to say that I'm a very, very, very easy taxpayer to please when it comes to United States spaceflight. I'm a middling-strength space junkie. Then, of course, came Challenger. Of course, I was only 16, and had led a sheltered enough life that I met assurances from Real Live Adults that the shuttle was fixed with trust and wide-eyed optimism. Turns out a reminder that rubber gets brittle in the cold wasn't enough, though: it bought us nine more years and a half-completed International Space Station. Then, Columbia. Columbia's breakup, for me, was more painful than Challenger's, because it made me look, really look, at the criticisms that had been leveled at the Shuttle design from its infancy: too complex, too delicate, too much institutional sickness at NASA. I'm well aware that spaceflight, especially manned spaceflight, is a constant dance of needle-threading the likes of which few of us can truly grasp. The speeds and temperatures of orbital insertion and reentry are hellish conditions, and every time it's done successfully is a testament to the steely-eyed missile men and women who've coaxed every last part of the million-element technological symphony to its assigned climax precisely on cue. The tolerances of the devices and vehicles we build for the tasks must be exacting. Even so, there are ways to mitigate risk, especially when building such an ethereally defined component as a heat shield. 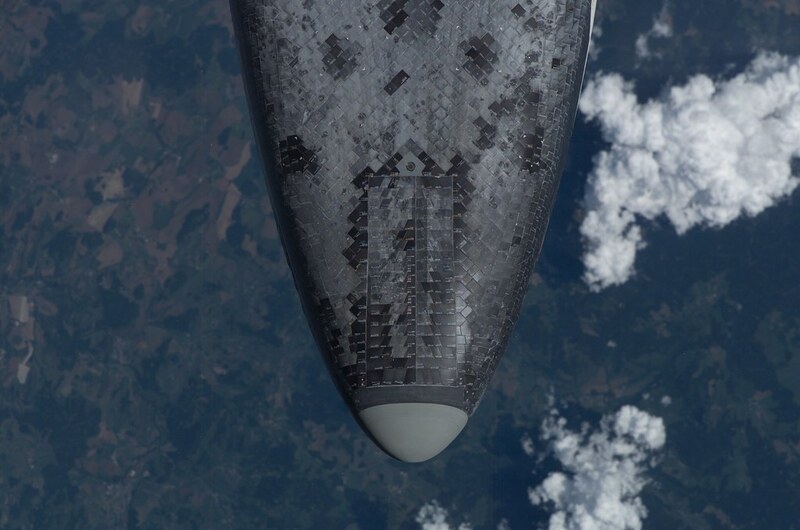 The shields used by the Apollo capsules were designed to ablate, or boil away, and damage to the component was similarly irreparable to that happening to Shuttle tiles, but the Apollo engineers evidently realized this, and so protected the heat shield within the spacecraft (sandwiched between the command and service modules) until right before it was time to reenter the atmosphere. We Have What for a Backup Plan? Altogether, nearly 32,000 [heat-shielding] tiles cover Columbia. No two tiles are alike and each must be installed by hand. ... These glass-covered silica tiles are rather brittle and cannot flex or bend without breaking. 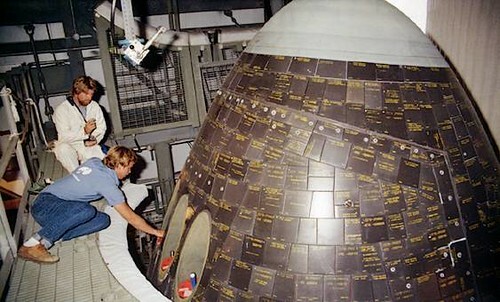 The above means that, short of carrying along a replacement for each and every one of the 32,000 tiles used, it's functionally impossible for astronauts to repair a shuttle that gets damaged during ascent, which is the period in which falling tank foam, unlucky birds and the like are most likely to inflict said damage. What kind of brain-dead fool constructs a heat-shield system with 32,000 fragile, non-interchangeable, non-user-serviceable parts, and then hangs it next to a pressurized, supercooled tank known to shed parts of its insulation while traveling at multiples of the speed of sound, then puts people aboard and fires it into space? A government-employed fool, that's what kind. I've worked on sane teams, and I've worked on insane teams. There's a certain level of institutional dysfunction required to greenlight a system as delicate and fault-intolerant as the thermal-tile system on the Shuttle. Even moreso to greenlight it now, considering that the foam-loss problem hasn't been solved, only alleviated. Right about now defenders of NASA will start asking, "okay, wiseguy, if the tile system is so bad, how do we fix it?" I don't know how to fix it: I'm a computer programmer. I do know, however, that you don't continue to deploy a proven life-threateningly-bad design. Either you fix it, or you pull it out of production until it's been either fixed or replaced. You don't keep using it because you've added sufficient spit-and-baling-wire that it appears safer. And yes, dozens of cameras and less dangerous foam constitute spit and baling wire, no matter how much has been spent on them. Risk can never be eliminated, but bad design should simply be labeled as such and then never used again. There are even schools of thought positing that the very idea of a heavy-lifting, reusable manned cargo transport is a bad one and we should always lift humans and equipment separately and with lots of small launches, but that's theory that I'm unable really to critique. All of the above was to say that the fact we're rejoicing in the successful launch, observation and return of a spacecraft whose design was conceived when Gerald Ford was president is not a great victory. Quite the opposite, in fact. Shame on us all for not demanding more from our space program. Personally, I was much more enthused by the successful launch and deployment of Bigelow Aerospace's Genesis I inflatable spacecraft this week, and of course all the activity going on around Virgin Galactic, SCALED Composites and the successor spacecraft to SpaceShipOne. My faith (and investment money, once I score some) are with the growing and energetic private spaceflight sector, even in its infancy. Because I haven't posted one in a while, here's an update! 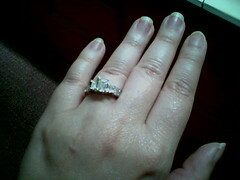 We haven't gotten to actual question-popping yet, but the lovely Amy and I did our first round of "bling shopping" last Friday, and the picture at right was one of the favorites of the evening: emerald-cut center stone, with princess-cut flankers and some channel-set baguettes, if memory serves. Luckily Amy is a size 7, which seems to be the size most display rings share. Tomorrow begins another round of ring shopping at a few stores that were specifically recommended by friends and family. Actual purchase of the bauble will not be with Amy present, though: purchase and presentation will be accomplished within the next month or so. Stealth is my watchword, and surprise my destination. Amy has acquired an account for us on TheKnot.com, and has been sending me frequent status reports on how things are going there. The tentative "date" is for mid-April of next year, so the schedule winds up being fairly aggressive if we keep to it. Nothing like having a website generate a task list for you, a third of whose items are already overdue. The Unreality of U.N. Reform: What if "Later" Never Comes? The United Nations has not showered itself with glory over the past decade-and-a-half, and I'd argue that there's very little noteworthy the U.N. has accomplished in its history in terms of statecraft or reining in the actions of rogue states. "You'd better stop that, or we're going to really sit down and discuss the problem...again" seems to be the modus operandi; even agreeing to something as straightforward as economic sanctions in response to flagrant violation of treaties and international agreements seems to be impossible, especially in recent years. The United States pays (or is supposed to pay; we've played fast and loose with that obligation over the years as a form of leverage) $440 million in dues to the U.N. annually: a little over a fifth of the U.N. budget. Given that the U.N. appears to be overwhelmingly corrupt, largely ineffectual and increasingly irrelevant, one has to wonder what in the world we're paying for! For those of us who think the United States Constitution is more than a set of guidelines and suggestions, the concept of almost any overarching world government is abhorrent. The United Nations is a world government, after a fashion, but most importantly it's a largely impotent world government. By comparison with an effective world government, perhaps, say, one imposing a mishmosh of Sharia and laws from the old Soviet Union, the United Nations looks vastly preferable. $440 million amounts to about 0.0163% (163 ten-thousandths of a percent, 'tain't much) of the $2.7 trillion federal budget for 2006. Sounds like a very wise investment, given the return of a do-nothing world government. Clean up the corruption so its "passive harm" is curtailed, but otherwise I'm very happy with the U.N.'s current blowhard status and do-nothing role. Just don't be tempted to use it as a means of getting anything done, or as any sort of yardstick for legitimacy. Major HTML Revamp--I Hope No One Notices! The visual changes are slight, but I'm doing so much surfing from my phone these days that I decided to rework Brain Squeezings' Blogger template (i.e., its HTML page layout) to be more mobile-browser friendly. Of course, it still looks like garbage in Pocket Internet Explorer's "Default" mode, but if you use "One Column" mode the site is very clean indeed. Everyone please hit Brain Squeezings with every OS (Windows, Mac, Linux, Windows Mobile, PalmOS), and every browser (IE, Mozilla, Safari, Firefox, Opera, Pocket IE, Blazer) and let me know if anything broke!